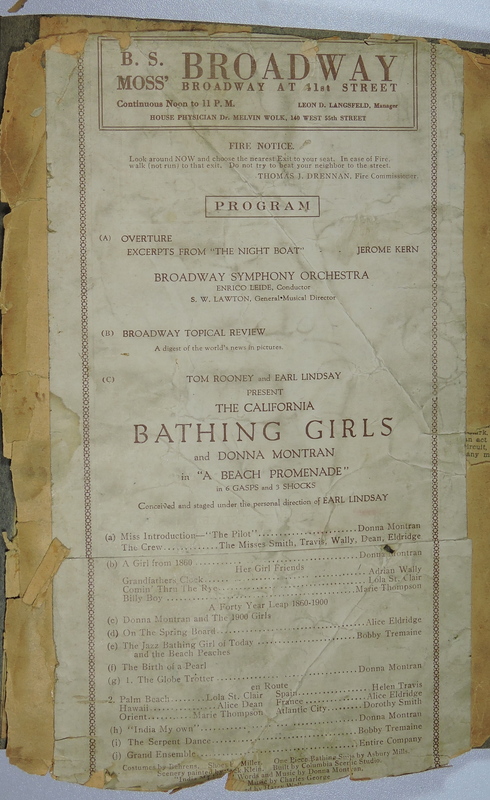 For this week’s Treasure Chest Tuesday, I am looking at three clippings from the Donna Darling Collection that indicate she played at three different Broadway Theaters; B.S. Moss’ Broadway theater in New York, The Broadway theater in Butte, (MT? ), and the Broadway theater in Long Branch, NJ. None of the clippings have dates. 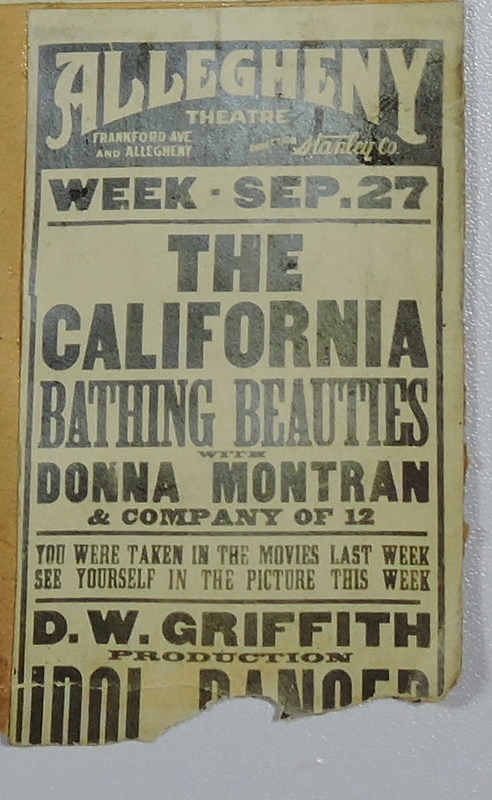 The first clipping is a rare playbill for The California Bathing Girls and Donna Montran in “A Beach Promenade.” Previous research found that this show ran over a month, from July 26 to August 29, 1920 at B.S. Moss’ Broadway Theater. The playbill provides much new information about the show. One of the most exciting things is that it provides names for the cast. Besides Donna Montran, the Bathing Beauties included Alice Dean, Alice Eldridge, Dorothy Smith, Lola St. Clair, Helen Travisand, and Marie Thompson. I was surprised to see what appears to be two men in the cast, Adrian Wally and Bobby Tremaine. Also, credit is given to Behrens for costumes, Shoes by Miller, One Piece Bathing suits by Asbury Mills and the scenery was painted by Jack Klein. Tom Rooney and Earl Lindsay were the producers and the show was conceived and staged under the personal direction of Earl Lindsay. The second clipping is an advertisement showing “An Outstanding Vaudeville Feature Act – DONNA DARLING REVUE With Sammy Clark and Company. 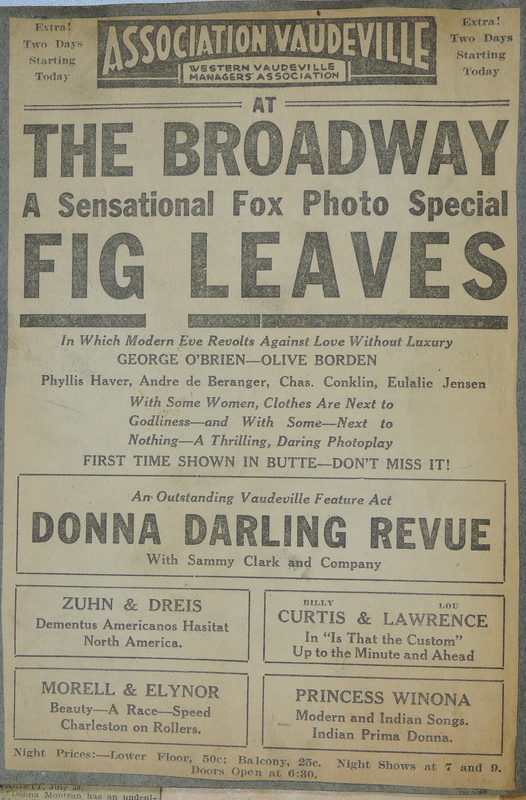 Showing with the Donna Darling Revue was a silent film, “Fig Leaves” starring George O’Brien and Olive Borden. According to IMDB, that film was released on 22 August 1926, so the show had to occur after that. Also, through other research I have found that the Donna Darling Review played on 27 November 1926. Butte and Helena are only 80 miles apart. With the schedule the show had, I’m sure that the Butte performance would have been within a day or two of the Helena performance. This clipping allowed me to add another venue for Donna’s performances with an approximate date. The final clipping that I am looking at this week relates to Donna and Sammy playing at the Broadway Theater in Long Branch, NJ. The program indicates that the “Darling Clark Revue” played Monday, Tuesday, and Wednesday, May 3-4-5. Donna and Sammy got together about 1925 and separated about 1930. The only year on which May 3rd, 4th, and 5th, was on a Monday, Tuesday, and Wednesday was 1926. It is interesting to see the show called “Terpsichore Personified” and “A Novel Dance Melange.” My memory of Donna is that she had an incredible vocabulary. My mom used to say that Donna could cut you down with words and you’d never know you had been cut. I have to admit I needed to look up “Terpsichore.” Terpsichore is one of the nine Greek Muses and is the goddess of dance and chorus. That is a description that I’m sure Donna liked. I suspect she probably wrote the portrayal. This is another new venue and date for Donna’s career. I will add it to my projects. 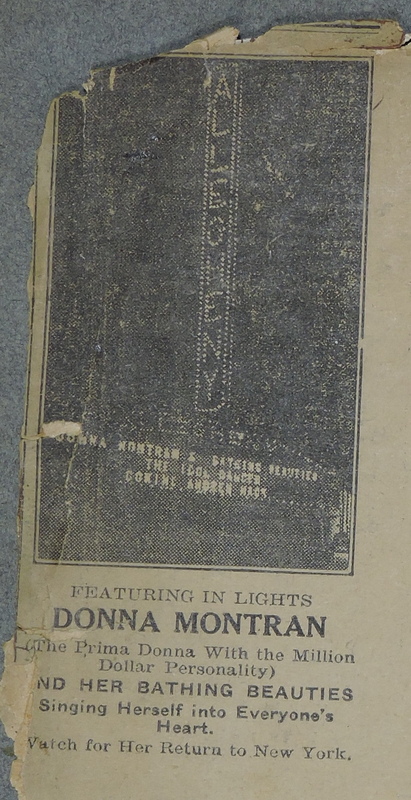 Research The Donna Darling Revue at the Broadway Theater, Butte, MT, between 24 and 30 November 1926. 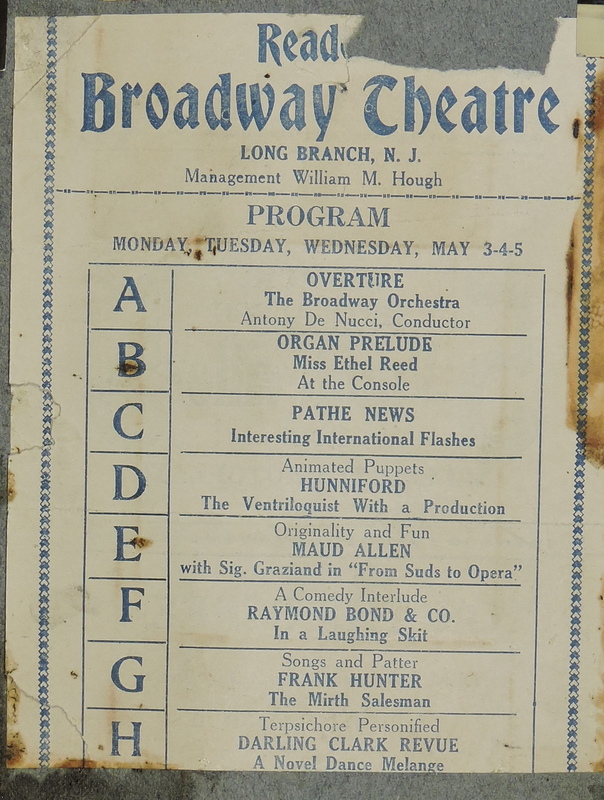 Research “Darling Clark Revue” at the Broadway Theater, Long Branch, NJ, on 3, 4, & 5 May 1926. Research Alice Dean, Alice Eldridge, Dorothy Smith, Lola St. Clair, Helen Travisand, Marie Thompson, Adrian Wally, Bobby Tremaine, Tom Rooney, and Earl Lindsay.